Bird cage waterers feature unique design and functionality to provide plenty of clean, healthy water to pet birds. Using a contained water bottle for your bird is a great alternative to simply filling up a water dish. Water dishes allow birds to spill and create wet, soppy messes in the cage...and you know who has to clean that mess up! Bird water silos prevent any spills and waste of water, meaning you spend less time cleaning and refilling, and more time enjoying your pet. 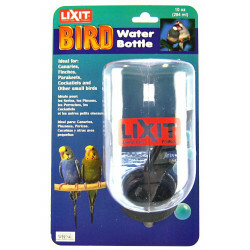 Bird cage water bottles are designed to suit the hydration needs of a wide variety of the most common types of pet birds, including canaries, finches, parakeets, cockatiels and other small household birds. Special leak-proof designs minimize wasted water by forcing your bird to use its tongue to create water flow. This is easy on the bird and makes life so much more convenient for you. 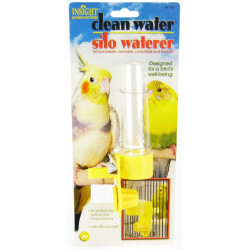 Bird water bottles attach easily and effectively to virtually any bird cage.